"While holding true to its mission and values, Kartemquin as an organization has consistently evolved over the last 49 years, and on the precipice of 50 in 2016 KTQ is poised for even brighter horizons! I cannot wait to see what the next chapter holds for an organization that I will always consider part of my extended family. 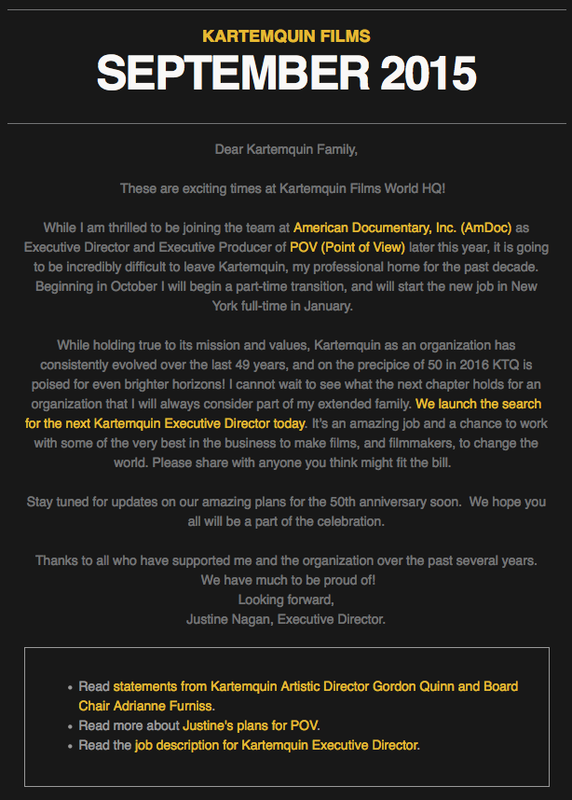 We launch the search for the next Kartemquin Executive Director today. It’s an amazing job and a chance to work with some of the very best in the business to make films, and filmmakers, to change the world. Please share with anyone you think might fit the bill." - Justine Nagan.